The question is always 'exactly *WHAT* is electric painting?'. It's not like anything else in the art gallery, we're not already accustomed to seeing this art-form. 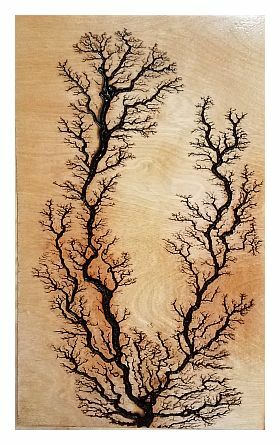 Refreshingly different, Robert uses 3000+ volts of electricity and a conductor of energy to create Lichtenberg Forms in wood. These are the fractal patterns that one would see in lightning, but instead embossed deeply, and with detail into the wood. Needless to say, this is dangerous, though Robert has studied his medium well and is an electrician by trade. Robert's other artistic passion is Bonsai design. With an appreciation of Eastern Aesthetics, Robert endeavors to control the forms as they grow and alter them as he does with the Bonsai into the composition of his vision. This 'live edge' Maple served as a wonderful recipient of the painting. Robert created forms on both sides for an impressive, natural sculpture. He also made an artistic pedestal by burning the box it resides upon. No two forms can grow the same, so each is an original piece of artwork in its own right. Because they are fractals, they mimic the macro and the microcosm; trees, tributaries, coral reef, dendrites, lightning, synapses, and more. Robert began hand painting within the structures to create contrast. In addition, he cut the work and began using these pieces as his 'artistic palette'. Wood is an easy design element. It seems to go with everything from an urban, contemporary dwelling, to the rustic, or even beach/surf shack informality. Robert's pieces are elegant and graceful, also relaxed and organic. Robert enjoys the outdoors, panning for gold with his wife, Sheila, and garnering more inspiration for his art. He currently resides in Eagle Creek, Oregon.